Cybele Lyle's 'Moon Is Slowly Rising' at Et al. 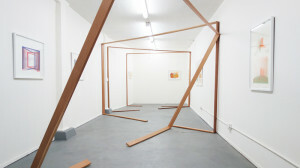 Cybele Lyle, Installation view of The Moon is Slowly Rising; courtesy of Et al. For just over a year, something's gone on underneath Kearney Street's Union Cleaners. There's no sign to point the way, but walk down a hall, hang a left, descend some stairs and enter a long windowless room lit by bright fluorescent bulbs. The spareness is a clue: this is a gallery, carved out of one of the least likely locales, steadily existing beneath the bustle of the street above. Et al., run by Facundo Argañaraz, Aaron Harbour, and Jackie Im, supports a small roster of artists and puts on a steady stream of solo and group exhibitions, performance events, and video screenings. The current exhibition, The Moon is Slowly Rising, is Cybele Lyle's first solo show with the gallery. Following a busy spring (with two simultaneous public installations in downtown San Francisco), Lyle presents an assured group of nine framed screen prints within a framework of raw wood rectangles criss-crossing the gallery space. "This show comes from the inside out," states the exhibition text. And for Lyle, that means "A visceral and intimate process of examining architecture and queer space." 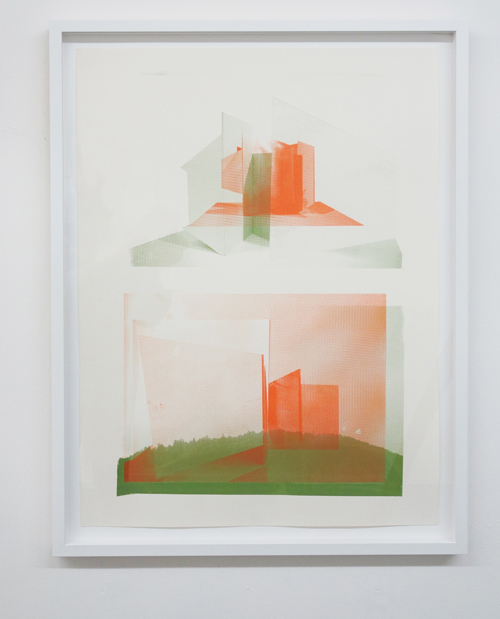 Cybele Lyle, Untitled (Screens 1), 2014; courtesy of Et al. Lyle's palette is a deliberate and subtle departure from previous works. Sourcing imagery from landscape photographs and small-scale studio models, she layers rocky or beachy horizons with hard edges, corners, and angled outlines. In pairings of red and royal blue, goldenrod and teal, soft green and peach, Lyle creates blended interior and exterior spaces. Rooms end in corners, frames open up to hilly views. With each layering, Lyle presents new, alternative spaces wholly her own. Form follows content: though she uses the easily-repeatable method of screen printing, each print in The Moon is Slowly Rising is unique. Certain images repeat (the framework inside the very gallery, for example) and the works use a serial system of titling, but Untitled (Screens 8) is very different from Untitled (Screens 3). In Screens 8, a vertical diptych shows architectural structures above, a tree line below. Screens 3 is yellowy-gold and dark purple; its central image looks like a small model on a table edge. In their coats of colored ink, all the screen prints share a bitmap-like pattern, resembling an enlargement of the screens' weaves. 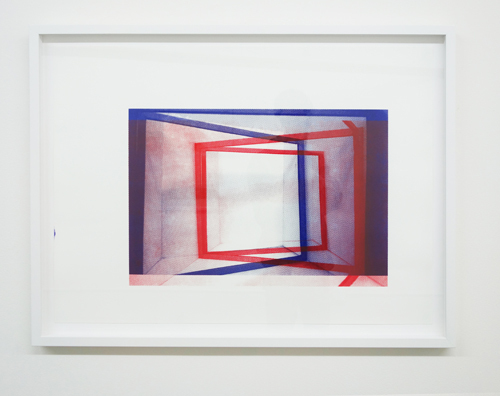 Cybele Lyle, Untitled (Screens 8), 2014; courtesy of Et al. The four wooden frames bisecting the room imply different planes within Et al. 's space. The first frame begins at the far end of the gallery, square to the back wall, extending from left to right and crossing just below the gallery's ceiling. As the frames approach the gallery entrance, they diverge from the 90-degree angle, until the last one loses the x, y, and z-axis completely, hanging at a disjointed cant. At the base of each frame, a jagged 3-foot path cuts through the implied narratives, a handy way to prevent tripping, and another effective description of space through absence. Each time Et al. mounts a new project, whether it's a group of paintings, a one-night publication launch, or –- in its current incarnation -- an installation of flatwork and three-dimensional structures, the gallery has the chameleon-like ability to change completely. Lyle's pieces fit well into this setting, challenging as they do the understanding of one dimension, one set of imagery, and one story. Make sure to factor Et al. into your gallery-hopping calendar in the months to come, as repeat visits yield repeatedly exciting and unexpected results. The Moon is Slowly Rising is on view through July 4, 2014 at Et al. in San Francisco. For more information visit etaletc.com.